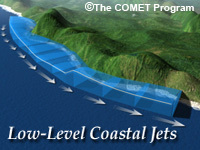 Low-level coastal jets occur along many coastlines. Winds may exceed 35 knots and lead to high waves and significant low-level vertical wind shear. Thus, low-level coastal jets present a hazard to both marine and aviation operations in the coastal zone. This core module describes the features of coastal jets and explores the conditions under which they form. Like other foundation modules in the Mesoscale Primer, this module starts with a forecast scenario and concludes with a concise summary and a final exam. By the end of this module, you should have sufficient background to diagnose and forecast coastal jets around the world and to use this knowledge to understand the implications for operational decisions. Several of the questions were misleading. Although I understand the process involved in LLJ development and identification, the test did not accurately determine that knowledge. Good lesson for study.Have enjoyed it. Outstanding course, strongly recommend it. Simple, well written explanation, without too much required prior knowledge. One thing, in the quiz one of the questions reads: "Daytime air temperatures over water are cooler/warmer than the air temperature over land. Nighttime air temperatures over water are cooler/warmer than the air temperature over land." Since the module talks about both the seabreeze circulations, where the answers would be "cooler" and "warmer", and also Low Level Coastal Jets (LLCJ), where the answers would be both "cooler", there needed to be some clarification as to what situation was being discussed, which in terms of this question was the LLCL. Otherwise, interesting, helpful, concise module.